Bellwether states and counties are those locations that have successfully voted for the winning presidential candidate over a period of time. In the ten elections from 1960 through 1996 only two states and eight counties have chosen the wining candidate each time. The states are Missouri and Delaware. The counties are Logan, AR; Van Buren, AR; New Castle, DE; Vigo, IN; Lincoln, MO; Socorro, NM; Eddy, NM; and Ferry, WA (note that the results for Ferry, WA ended in a tie between Dukakis and Bush in 1988). The map below shows the bellwether locations. In Election 2000, George Bush won the electoral vote by only five votes (1%) and Al Gore won the national popular vote by only 539,898 votes (0.49%). The last time such a split happened was in 1888. In such an extremely close election, the candidate with the broadest geographic appeal wins. This is an intentional result of the Electoral College design (to prevent one region from dominating the Presidency). Each state has two Senators and therefore two electoral votes, regardless of population. George Bush had a larger geographic appeal, winning more states than Gore by a margin of 30 to 21. This appeal is even more pronounced when looking at counties where Bush trounced Gore 2,478 to 675. This result is due to the general split of support between urban and rural populations. Bush tended to win the rural locations and Gore fared better in the urban centers. See the national county map. The election results in the bellwether locations reflect this urban/rural result. 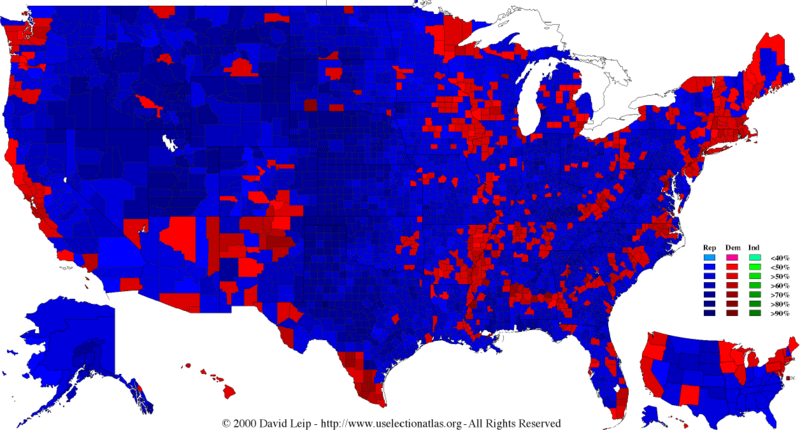 In fact, the election results in most of these counties have a significantly larger margin of victory than the nation as a whole. Of the eight counties, none had a margin of victory of 1% or less. Only two of the counties had a margin of less than 2%. The remaining six counties had an average margin of victory of 20.4%! Of the eight counties, only New Castle, DE has a sizeable urban population. Here, Gore won by 22 percentage points! Gore's victory in New Castle county was also large enough to carry the bellwether state of Delaware by a narrower, but still large 13 percentage points. In the most rural bellwether county, Ferry, WA, Bush had a 31.7% margin of victory. The only rural county that voted for Gore was Socorro, NM.